Sciblogs | Interphone – is the mobile industry in for a nasty shock? Interphone – is the mobile industry in for a nasty shock? The long-awaited final report of the 10 year-long, 20 million pound Interphone study into whether mobile phone use can cause brain cancer is set to be published before the end of the year, according to reports from the UK over the weekend. The results are expected to cause some concern for the mobile industry and the world’s four billion mobile phone users because they are expected to indicated that long-term, heavy mobile phone usage leads to an increased risk of developing brain tumours. But the picture isn’t as clear as that, which may well make the publication of the Interphone study in a peer-reviewed journal in the coming weeks one of the more controversial science stories of the year. New Zealand participated in Interphone, which is a series of “multi-national case-control studies to assess whether radio-frequency exposure from mobile phones is associated with cancer risk” organised by the World Health Organisation. The study is already controversial – this Economist article outlines the reasons for that, but essentially there have been many questions raised about the methodology the study used and a preliminary release of data seems to have caused widespread confusion on the issue. This from the Economist in September last year, when the final report was due to be released, on the subject of ‘recall bias’ and the Interphone study. “Recall bias happened because the study was retrospective rather than prospective. In other words it looked at what people had done in the past rather than following their behaviour into the future. In practice, that meant asking them about past behaviour, and relying on the accuracy of their memories. Of the 13 single-country studies undertaken as part of Interphone, the results from nine of them have been released – with several reporting an increased risk of brain tumours among mobile phone users after ten years of mobile use. Working through the impact of the recall bias is one reason given for the lengthy delays in publishing the Interphone study. There has also been, the Economist alleges, intense disagreement between the scientists involved in the study. How the final version of the Interphone study is received by the scientific community is going to be crucial to what impact the research has on government regulations, industry standards and consumer behaviour. The implications for the mobile industry are huge. In New Zealand, mobile phone penetration is over 100 per cent – some of us have more than one active mobile connection. Two new mobile networks have been built here in the last couple of years. Mobile chipsets are increasingly being built into laptops and netbooks to give people the convenience of accessing the internet on the move. Mobile phone companies have encouraged people to drop their fixed landline in favour of all-mobile alternatives like Vodafone At Home. Mobile use is such a pervasive part of our lives in the age of the iPhone and text messaging that some clear conclusions leading to clear guidelines are needed on the safety of mobile use. The World Health Organisation will have to take some clear leadership here in the next few months in conjunction with governments around the world. – Are there any risks from long-term, heavy use of other wireless technologies (different frequencies) such as Wifi, Bluetooth, WiMAX, DECT. Many of us will be coming up on ten years usage of Wifi soon – all of my internet usage at home and in the office takes place over Wifi connections. – Are there any risks posed by cell sites, especially as cell base stations are increasingly being placed at street level in inner-city areas to fill in coverage zones. 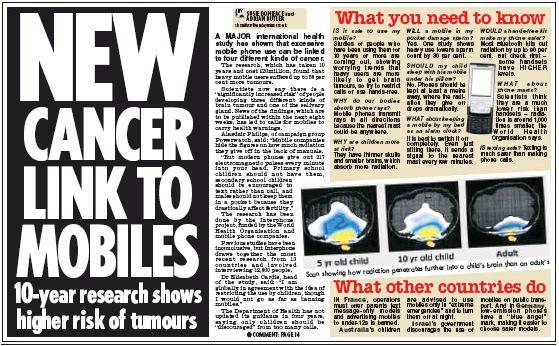 All along we have been told that mobile phone use, wifi use, cell towers pose no health risk to people. If Interphone provides compelling evidence to the contrary the mobile industry could be faced with a threat to its business akin to the disastrous Europe spectrum auctions that opened the millenium.